There was an earthquake swarm in this region in 2013. The largest magnitude earthquake had a magnitude of M = 5.7. Here is the USGS page for that earthquake. “Today” we got a M = 3.8 earthquake in this same region. Here is the USGS web page for today’s earthquake. The Indian Valley fault is at the northern end of the Mohawk Valley fault system. We will be taking a look at this fault system (and the sedimentary/stratigraphic history) for this year’s Pacific Cell Friends of the Pleistocene field trip. The Mohawk Valley fault system is probably the northern extension of the Walker Lane. The Walker Lane is the northernmost extension of the east-of-the-Sierra-Nevada-mtns part of the plate boundary between the North America and Pacific plates (the most well known part of this plate boundary is the San Andreas fault). We looked at the Walker Lane for the 2010 Pacific Cell Friends of the Pleistocene field trip. We looked at faulting in the Lake Tahoe region for the 2012 Pacific Cell Friends of the Pleistocene field trip. 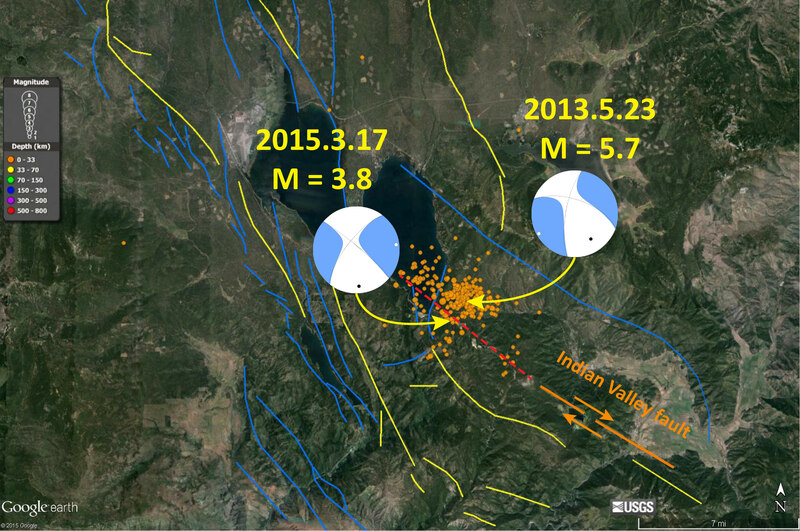 Here is a map showing the swarm from 2013, as well as the location of today’s M 3.8 earthquake. All orange dots represent earthquake epicenters from the year of 2013. 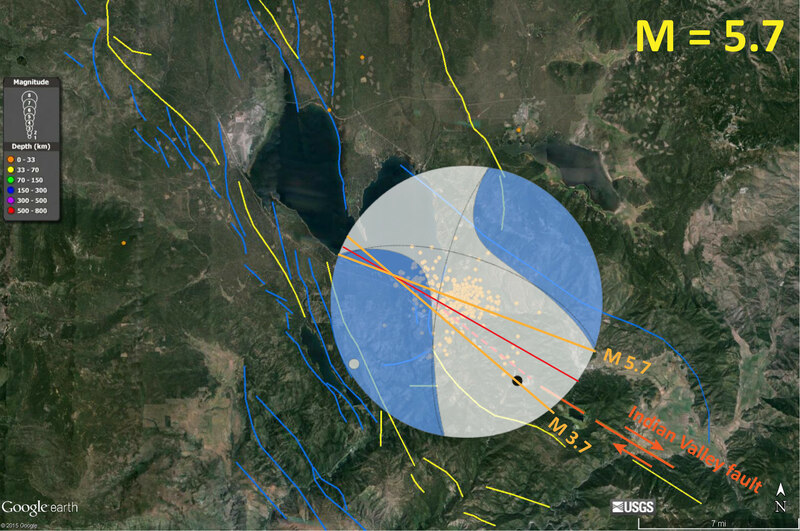 On the map I have placed the moment tensors for the M 5.7 and M 3.8 earthquakes. The Indian Valley fault is shown in orange. I extended this fault (as a red dashed line) to where it may exist, based upon the recent seismicity. All the other lines are from the USGS fault and fold database. Anyone can use these fault data and they are downloadable here. Here is the map that I made in 2013. Note the yellow fault lines that are near the town of Sierra. These represent the Mohwk Valley fault zone. There was a swarm near Mt. Lassen in November 2014. I posted about this swarm at the time here. Here is a map showing that swarm. Here is a primer for the different types of earthquake faults and moment tensor/focal mechanisms. This comes from the USGS. This explains focal mechanisms. Moment tensors (which I use on my figures above) are determined differently, but their graphical solution/representation is the same as for focal mechanisms (for all practical purposes). Here is the USGS page on moment tensors if you want to learn more about them. Here are three maps that have moment tensor data plotted. The first one shows the moment tensor for the M 3.8 earthquake. I have plotted the two moment tensor strike lines as light orange, each labeled. The mean strike line (geometrical construction) is plotted in red. This second one shows the moment tensor for the M 5.7 earthquake. 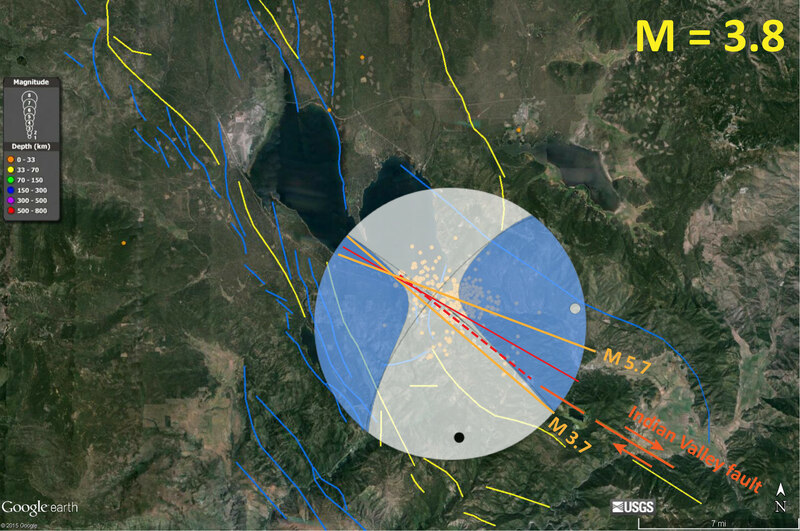 This final one shows a pure strike slip focal mechanism for an earthquake with the same strike as the mapped Indian Valley fault, immediately to the south east of Lake Almanor. En echelon fracturing with lakes in the pull-apart basins. No more excuses! I’m going on this one! 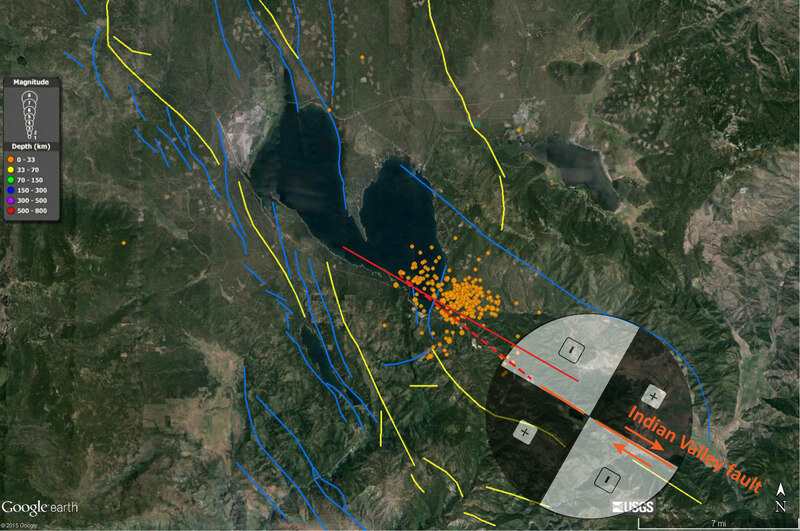 Yes, the Lake Almanor basin is a pull apart basin resulting from a releasing bend between the northern Mohawk Valley-Indian Valley fault system and the southern Hat Creek graben. See 1995 Pacific Cell FOP guidebook for more details, or better yet attend this years trip! Maybe that’ll stop the Thermal Curtain! Nice!! Can’t wait for this year’s trip! I know Chris Madden Madugo and I are chompin’ at the bit! neither can I! (glad that I did not move to paris, so that I can go to this years FOP). it is going to be epic. If you have any that I have not posted, please get them to me!